Mandhangi Mohan is a sotware engineer working in one of the leading IT companies at Chennai. She has a passion for paintings from her childhood. 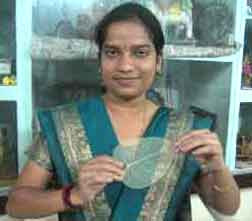 She is involved in glass painting, Tanjore painting, oil painting, fabric painting, poster colour painting, water colour painting. She even paints on wastes like coconut shells, etc. What is unique is her ability to draw pictures on leaf skeletons. (see her picture holding a leaf skeleton). It is not so easy to draw pictures on the leaves. 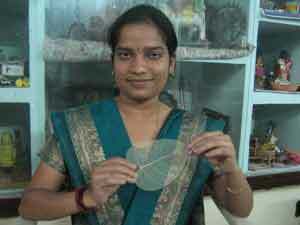 She picks up the best suited banyan leaf and passionately prepares each leaf for one month, to get the skeleton. Then she paints the pictures on the leaf skeleton. Her father Mr Mohan is the Deputy General Manager of BSNL and when I visited their house, I found many pictures adorning the walls of the house. I was amazed by the passion that she has shown for developing this art. She is quite fortunate that both her father and mother take all the efforts in supporting her initiatives and developing her talents. Though she has not commercialised her talents, shortly, she plans to put an art gallery with all her paintings. I could not resist the desire of taking a podcast interview with this talented young girl. Please listen to her interview by clicking 'play' button in the flash player below. The audio streaming will be smooth in broadband connections. If the streaming is not smooth, you may download this audio in mp3 format, by right clicking this link and saving the target/link to your desktop. 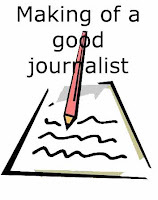 November 2009 issue of Corporate ezine PR-e-Sense focusses on 'Making of a Journalist'. This issue is Guest Edited by Ms Megha Gupta, an young journalist from Mumbai. 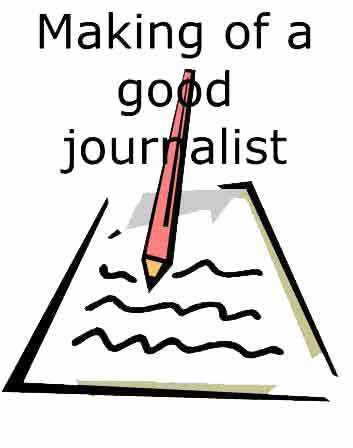 As part of the ezine, we made a quick online survey on the current status of the present day journalism. We have studied the aspirations of the entrants for the profession, whether the educational institutions offer suitable inputs, etc. In this podcast intervew, we have taken views of three people. 1. Sherry Italia - A journalism student from Pune speaks about her aspirations and her views on the present day media. 2. Megha Gupta, Guest Editor, explains the outcome of the online survey along with her observations. 3. Mr R Bhagwan Singh, Consulting Editor, Deccan Chronicle speaks about the quality of academic inputs, media training provided by the Media Houses and also the attitude of young jounralists. The ezine may be downloaded from our site. Please listen to the podcast, by clicking 'play' button int he flash player below. The audio streaming will be smooth in broadband connections. If the streaming is not smooth, you may download the audio in mp3 format, by right clicking this link and saving to your desktop. The podcast may also be listened from the following links also.